“Mozart’s Sister,” written, directed, and produced by French director Rene Féret and starring his daughter Marie, is the “re-imagined” story of Maria Anna, nicknamed “Nannerl”-Mozart’s sister– during her years from about 14 to 16. Immensely gifted herself on both violin and harpsichord and blessed with a beautiful voice, Nannerl is the original object of her father’s ambitions. Until little Wolfgang begins to show his talent (at age 3 or 4), Papa Léopold, himself a noted composer, instructs Nannerl and tours her around Europe’s capitals to perform. Later, Wolfgang becomes the star, and Léopold forbids Nannerl to play the violin (unbecoming to a woman!) and refuses to include her in the composition lessons that he gives her brother. It’s easy, while watching “Mozart’s Sister,” to get so seduced by its beauty, both visual and aural, that you overlook the misery of the lives being depicted: the 18th century is not an era to which we’d want to return, despite the gorgeous clothing and the sublime music. As Féret shows, most people’s lives, including those of the Mozart family, were hard, cold (at least physically), and in many cases, brief (though Maria Anna lived to 78). The Mozarts-father Léopold (Marc Barbé), mother Anna-Maria (Delphine Chuillot), ten-year-old Wolfgang (David Moreau), and 14-year-old Maria Anna (Marie Féret)—travel for days in horse-drawn carriages, often shivering, trying to nap along the way, from one European noble house to another, showing off the achievements of the children. On their destinations, the whole family shares one bed. During that period, parents and children are often separated: upper-class families, one character explains, normally send their newborns off with a wet-nurse into the countryside. Of the seven daughters of France’s Louis XV, the three youngest are sent to an abbey at an early age, never to see their parents again. At least one, Louise (Lisa Féret—another Féret family member), becomes a nun while still in her early teens. Before that, Louise and Nannerl form a tender friendship while the Mozart family are stranded at the abbey because of a broken axle. The Mozart family, however, are loving and close-knit. The bond between Nannerl and her mother is portrayed with special sensitivity, and despite Papa Mozart’s dictatorial behavior with regard to Nannerl’s talents and ambitions-and though the children are, in effect, Léopold’s cash cows–his love for them transcends the monetary. 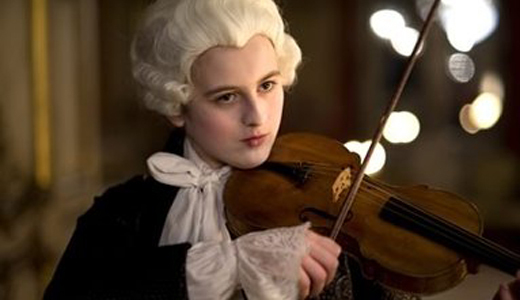 The center of the film is the Mozarts’ stay in Paris, where Nannerl meets and falls in love with the Dauphin, the king’s son (Clovis Fouin). Their scenes together, including ones in which Nannerl is disguised as a boy, are tender; but here’s where the script challenges plausibility. A good deal is actually known about Nannerl’s life, and it doesn’t come close to including any relationship, however platonic, with royalty. But it’s easy to overlook such flights of fancy. “Mozart’s Sister” is simply ravishing: the costumes, the sets, the moody lighting. The music! Nannerl’s own compositions are all lost, and “her” music is composed by Marie-Jeanne Serero in the Mozartian style, but somehow more-feminine. The story is a tragic one of how women were essentially imprisoned in their assigned roles (little Louise de France, a new nun, is shown finally behind an iron grille-behind bars, in effect). But how movingly told!